The TV Special: This DVD of our one-hour TV special — "Rick Steves' European Easter" — takes you on a spring journey through Spain, Slovenia, Switzerland, Italy, and Greece. You'll feel the emotion of this special time as the Passion of Christ unfolds during Holy Week. We'll join Andalusians carrying parade floats, Greek priests tossing showers of flower petals, and villagers blessing olive branches, plus feasting, fireworks, and more. 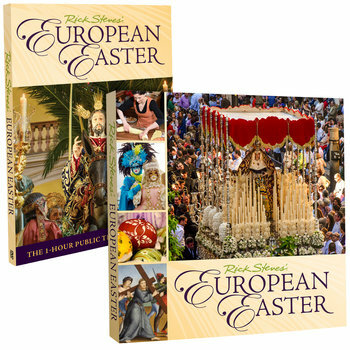 The Book: This colorful, 200-page companion book to our European Easter TV special includes details on the rich and fascinating mix of Easter traditions across Europe, from its pagan roots to its glorious finale, plus a behind-the-scenes chapter on how the TV special was made.